We live in an age when everyone is trying to live richer, fuller lives. We're told to buy this, try that, eat those, and say no to the rest, as if that's all we need to do to make our lives complete. Two thousand years ago, the church at Colossae faced similar challenges. The Apostle Paul wrote a letter outlining the only way we can live complete lives: Christ. What can we learn today from this ancient church? Called by many scholars the "most profound letter Paul ever wrote," Colossians warrants a careful, faithful study. In this short, but exciting letter, Paul makes the case for the supremacy of Christ in all things. Best selling author and teacher Warren Wiersbe calls your attention to Paul's essential thoughts on living a complete life-Christ alone-in this easy-to-use commentary on Colossians. Be Complete Colossians by Warren Wiersbe was published by David C Cook in June 2008 and is our 4850th best seller. The ISBN for Be Complete Colossians is 9781434767806. 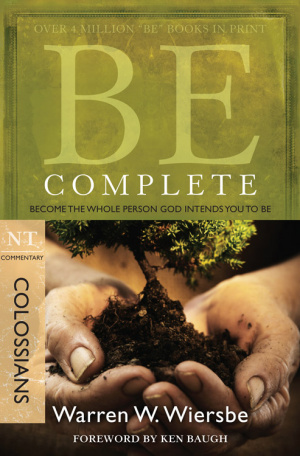 Be the first to review Be Complete Colossians! Got a question? No problem! Just click here to ask us about Be Complete Colossians.